SNES Secret of Mana (USA) in 1:46:29.9 by Touch-me. A Secret of Mana TAS has finally come to TASVideos! 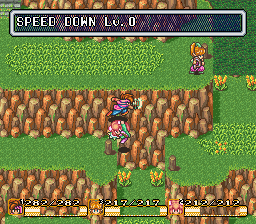 Secret of Mana is a widely popular action RPG published by Square. It is internationally regarded as the first game of the Mana series, though the Japanese title is Seiken Densetsu 2, so it is the sequel of Final Fantasy Adventure. It utilizes real-time battles like many other action RPGs while including some unique features such as the Ring Command and multiplayer action. Touch-me beats the game very quickly, using three players simultaneously and a whole host of glitches. For instance, many bosses can be hit for 999 instant damage using a charge counter glitch, and certain plot points are skipped. See the submission comments for more details. The YouTube encode contains commentary from the author in the form of hard subtitles.